There always seems to be at least a little bit of leftover crust when you make a pie. This recipe puts those leftover scraps to use! These are great for the family to snack on before the pie is served. My mom always makes these when she bakes a pie and we were the lucky recipients of these yummy treats. My Mom doesn’t measure when she bakes, so I followed along to get the measurements. 1 Roll out the pie crust very very thin (about 6×12 at 1/8″ thick) in a rectangle. 2 Brush the soft butter on carefully with a knife (or your fingers) so that it covers the whole rectangle in a thin layer (use more or less butter as needed). Sprinkle the sugar and cinnamon evenly over the butter. 3 Roll up from the shorter end. Leave the seam side down and fold the ends under. Then cut into 1 inch pieces and put in an oven safe dish along with your pie (350 degrees works well) and bake for about 20-30 minutes. oh my gosh! My mom used to make these for me when I was just a wee lass 🙂 I made them for my children, and don’t tell anyone, but hubby and I indulge in these from time to time-hey, we are retired, we can do anything we want! 🙂 Thank you for reminding me of some precious memories from past years. So happy to hear you and hubby are having ablast, thanks for sharing the memories! Hi it’s Erica from EricasRecipes – OH MY GOSH this post takes me back to my childhood! My mom always did this with leftover pie crust! Love those wonderful food childhood memories, thanks for sharing! My Mom made these too. We poured milk over them when then they were still warm. Yum! Yum! 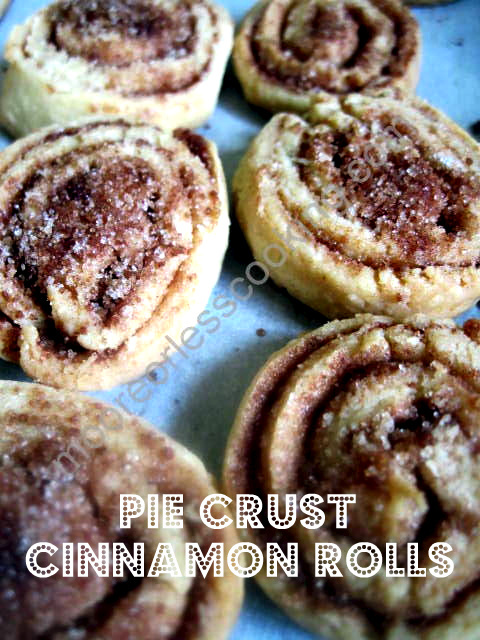 My mom would have extra crust left over and she would make what we called “Poor Man Pies” … we would sprinkle cinnamon & sugar over the flattened crust and drizzle some glaze over the top made with water & powdered sugar. YUM again!! Love the name two chews! Yes they are, I didn’t realize how popular this recipe was until I posted it! Thanks for sharing Joan! Unlike all of you it was my granny that made these for us kids…..no matter whatever else was made these were always the favorite of all and a tradition carried on even now…ppl speak of comfort foods so I guess this would be one of mine along with the memories that go along with them! Thank you for sharing Rita! My Mom always made these when she was making a pie or tarts. The only difference was brown sugar. These were family favorites, they would be chosen before butter tarts, jam and coconut tarts etc.